This issue’s article is “Supersutras” by Kenneth Williams. 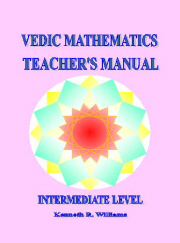 The next Vedic Mathematics Teacher Training course (the 7th in the series) starts 16th August 2014. Sri Bharati Krishna Tirthaji’s monumental work “Vedic Mathematics” was first published in 1965, so next year sees the 50th anniversary of publication. Preparations are already underway to mark this seminal event, and we would like to hear from you. Please contact us at with your suggestions how to mark this occasion, and especially if you can help in some way. This could be by organising talks/courses in your area, publicity for VM (e.g. articles in newspapers/journals), contacting education officials, arranging discussions on the nature of VM and how to move forward, etc. Our webmaster, Clive Middleton, has continued to perform his magic on the website. The drop-down menus now work better and the pages have been adjusted to make content on the main website easier to read on smartphones. It is translation of his book 'Modern Approach to Speed Math Secret'. Soon it will be translated into Hindi. Our organization Success WIth Self (SWIS) has initiated three years ago, Vedic maths courses under the name Vegam (Veda Ganitam the Amazing Mathematics). The course is offered as four level study. Level I (Basic Course) covering Addition, Subtraction, Multiplication and division and a little bit of squares, is offered as three months course (2 hrs, once a week on Sundays) and several batches of students have attended in the last three years. This year we are introducing Level II (Advanced Course) covering Advanced Multiplication and division, divisibility tests, squares, squareroots, cubes cuberoots, LCM, HCF, time and work study problems, interest, perimeter and area calculations. Level III (Expert Course) will be introduced next year covering Vedic Algebra. Level IV (Masters Course) on advanced topics like Trignometry, coordinate geometry, calculus, etc. may be introduced as a learn-through-discovery study at a later stage. Apart from the Sunday classes mentioned above, we are organizing the course at Schools also. Dayanand Anglo Vedic Public School (DAV) have invited us to organize the course as a part of the regular studies on weekdays. We are now teaching a nine month course with one period (45min to 50min) once every week at three of the DAV schools in Hyderabad during 2013-14. This year (2014-15) we are introducing Level II in the schools. The course is covering over 1300 students at the three DAV Schools mentioned above. In his book “Vedic Mathematics” Sri Bharati Krishna Tirthaji describes the sixteen basic sutras and shows many applications of them. Sometimes however two or more sutras are used together to achieve some result. For example, to find 7158 divided by 166 we may apply ‘Proportionately’ and ‘Vertically and Crosswise’. That is, halve these numbers, and find 3579 divided by 83. This makes the calculation easier. In finding the Highest Common Factor of two expressions Bharati Krishna invokes three sutras: ‘By Alternate Elimination and Retention’, ‘By Addition and by Subtraction’ and ‘The First by the First and the Last by the Last’. These together achieve the required result. In these examples (and there are many others in Tirthaji’s book) we have a single result, acquired by the operation of two or more Sutras. This is a sort of higher level Sutra application in which a more sophisticated mathematical result is obtained. We could call the application of two or more Sutras, used in combination to achieve a specific result, a Supersutra. Take the simple process of plotting a point on a graph. We have the coordinates, say (5,2), and we want to locate the point indicated by them on a graph. We take the 5 first and deal with the 2 later (this is ‘By Alternate Elimination and Retention’). We count (‘By One More than the One Before’) 5 units, or locate (‘By Mere Observation’) the 5 on the horizontal axis. We then take the 2 and do the same thing on the vertical axis (‘Transpose and Apply’). This fixes the point which we can then plot. Maybe you can see more Sutras at work here. We see several sutras operating here, but one result: we have plotted a single point. ‘Plotting a Point’ we could say is a Supersutra. We cannot say that there is a single Sutra for plotting a point as several are involved. Similarly the process of finding the Highest Common Factor would be a Supersutra. We could take this further because plotting a point may be part of a greater activity: maybe we are constructing a complex shape requiring many plotted points. We may wish to combine two or more Supersutras together. Could we also call this a Supersutra or do we need another name for a combination of Supersutras? Just as the dancer or acrobat can combine a sequence of actions that form a pleasing whole, starting and ending in rest, so the mind can combine basic mental actions to perform more intricate ones. And in chemistry we have the basic elements which combine and create more complex structures called molecules and those molecules themselves can combine. So in mathematics we have sixteen operational elements which can combine to create more elaborate operational structures. Perhaps, by starting with a combination of two or more Sutras a new mathematical technique could be discovered, or even a new or hitherto unrecognized mental process.